In this post I am going to share a technique to troubleshoot "module could not be found" exception in managed/.NET application due to missing native DLL dependency. The difficulty in troubleshooting this exception is it doesn't provide any information about the missing DLL(e.g. 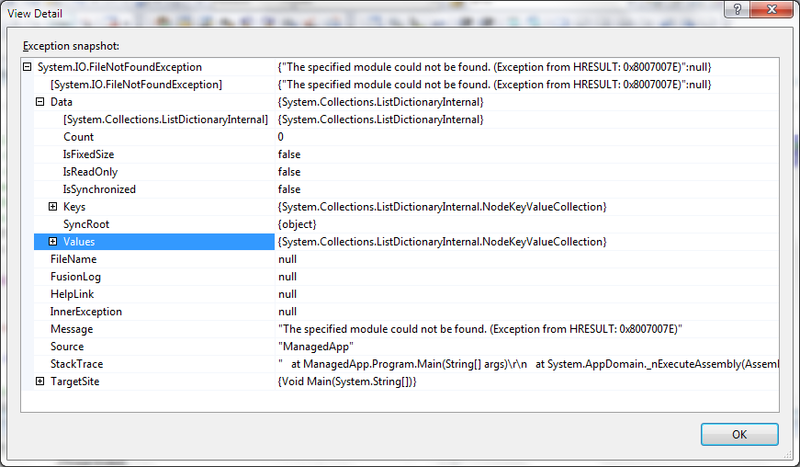 file name) apart from the exception message "module could not be found". for readability the DLLs are implemented in the header itself. So with this dependency and implementation if we place all the three binaries(ManagedApp.exe, CppCliDll.dll and NativeDll.dll) in same directory and run the ManagedApp.exe we will get the following expected output. the exception doesn't provide any clue about which DLL is missing. If the application depends on small no. 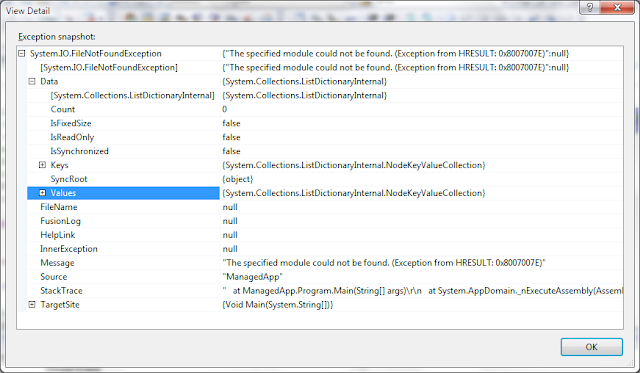 of DLLs(like the ManagedApp.exe) then it is relatively easy to guess which DLL could be missing. But it will be really difficult to guess if the application depends(directly and indirectly) on more no. of (e.g. 20+) DLLs. It will be even more difficult if one of our dependency DLL assumes presence of system wide DLL like libcrypto.dll(part of OpenSSL). The strange thing here is if the managed DLL(here CppCliDll.dll) is not present in the directory then we'll get a exception with information explaining exactly which DLL is missing. Unhandled Exception: System.IO.FileNotFoundException: Could not load file or assembly 'CppCliDll, Version=1.0.4824.22063, Culture=neutral, PublicKeyToken=null' or one of its dependencies. The system cannot find the file specified. But I don't understand why that crucial information is not available in the exception when the native dependency of managed app/DLL is missing. I also tried the Fusion logs but even that didn't provide any clue which DLL we are missing. I've wasted many hours trying to find the missing DLL before finding the following technique. The technique I finally found to troubleshoot this exception is using the ProcessMonitor. ProcessMonitor is a tool provided by Microsoft(originally SysInternals which is bought by Microsoft) and it can monitor system events like access to file, network, registry and etc. 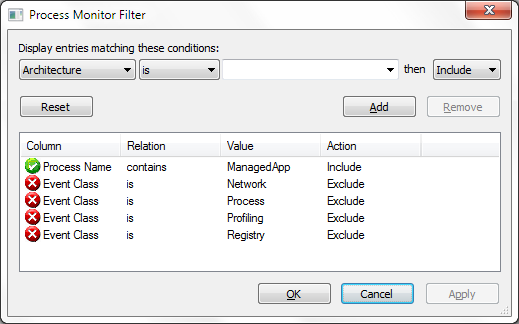 It provides various options like filtering in which it will show events related to specific process. 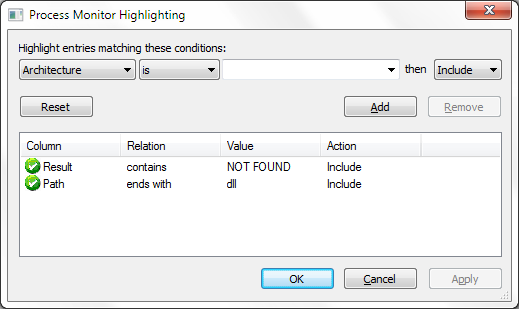 Add highlighting for "Path" field ending with value "dll"
Add highlighting for "Result" field containing with value "NOT FOUND"
now run the application and it will show the same error message that we've observed earlier. Now stop capturing events in the ProcessMonitor and look for for highlighted row starting from the latest event(bottom) to oldest event(top). When you find a highlighted row observe the corresponding DLL file name and make sure the same DLL file name is not opened successfully in the future(towards bottom) or past(towards top). You can also narrow down the search space by considering file opening attempt that happened only in the application directory(the directory where ManagedApp.exe present). in the above screenshot the red highlighted row shows that an attempt to open "NativeDll.dll" failed and the loader tries to open the DLL in various other places like "C:\Windows\system" and etc. If you fully analyze the events you can confirm that all attempts to open the DLL would have failed. 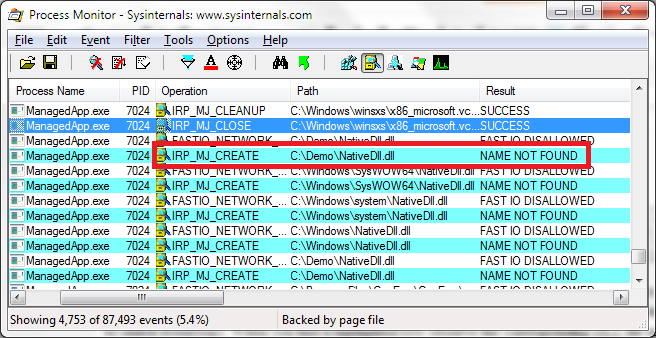 So this clearly shows that the missing DLL is "NativeDll.dll" file. This approach of analyzing the ProcessMonitor file system events is little tricky and as well as time consuming. That is why I came up with the following python script which can analyze the ProcessMonitor file system events exported as CSV and it can report the missing DLLs. print "Usage: FindMissingDll <process monitor csv exported file>"
# "Time of Day","Process Name","PID","Operation","Path","Result","Detail"
print "Attemmpt to open the following dlls failed:"
So with this technique and the script I hope whoever struggling with "module could not be found" exception can easily find the missing DLL(s). Reddit user 'monumentshorts' brought to my attention that the topic is already blogged here and here. So you can also refer those URLs for more information about the topic. Thanks for the info 'monumentshorts'. Very well put and argumented tutorial. In order to find the missing native dll you could use their DependencyWalker (depends.exe) tool - junst drag the managed c++ dll onto it and it will show all the dlls it depends upon, and also will mark the missing one. It will take you less than 30 seconds to get which dll is actually missing. In addition, it has more neat features such as profilying - this will enable you to check for dlls that you load explicitely during the app execution. Well, it is true for native executables and DLLs. But I don't think "Dependency Walker" can able to identify missing indirect dependencies like CLR Executable/DLL -> C++/CLI DLL -> Native DLL(missing). I am developing an Universal Windows application and get the exact same exception. Identically as you, I have a native Win32 DLL, then a c++/CLI dll, and finally a C# app. I tried using ProcMon, but I cannot peek inside what's going on inside the Emulator or device. Can you advise me how to troubleshoot a similar problem, but with Windows Universal apps? Thank you for sharing. It helped me. I often cope with such problems by replacing the old files with new ones. Download new files here http://fix4dll.com/d3dx9_39_dll. Maybe someone will come in handy. Thanks for the help.